Incheon’s lost maritime history is recovered by recreating an inland sea around the historical Ahamdo island: allowing it to be an island once again. This sea will incorporate artificial reefs to shelter a delicate wetland ecosystem with an urban wilderness park running through it. 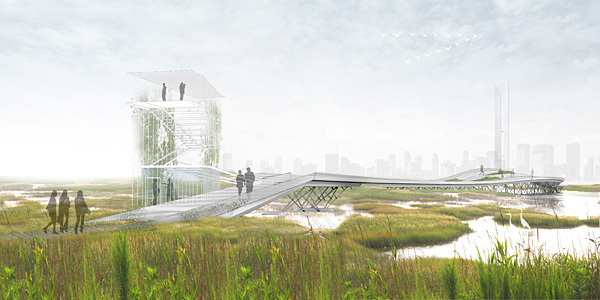 Recreation areas, visitor’s center, and a floating pontoon pedestrian bridge reminiscent of the historical path to Ahamdo are integrated in ways that allow damaged ecosystem to regenerate while simultaneously drawing visitors to witness the gradual change. 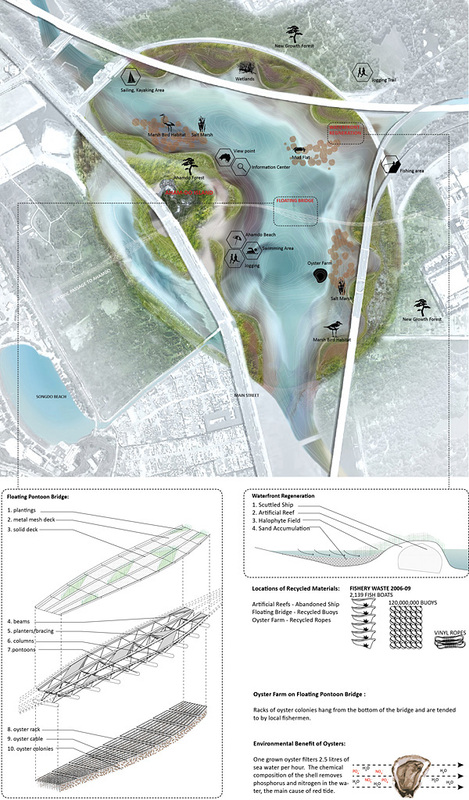 The landscapes are specifically designed to stabilize and regenerate the marsh while filtering polluting runoff from the adjacent urbanized areas. Thousands of abandoned boating vessels are re-used to create artificial reefs that control tidal flow allowing the re-creation of the tidal marsh to support local plants and wildlife. 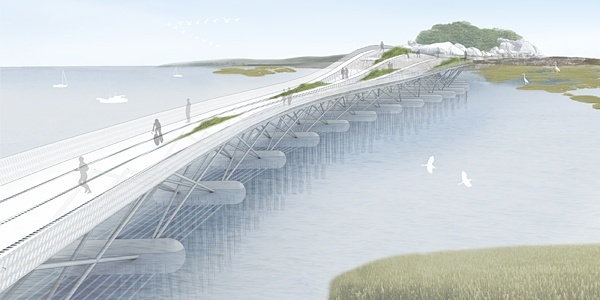 The new pedestrian bridge also doubles as an oyster habitat to filter and replenish the pollutants in the water. Historic views of Ahamdo Island, circa 1930 (left) – One of Incheon’s most significant cultural locations, it was tenuously connected to the land by a footbridge exposed only during low tide. Current conditions of Ahamdo Island show it closed in by infrastructure and infill (right). The new varied topography allows for a diversity of plant and wildlife habitats. Amidst the habitats, a visitor’s center lightly touches the ground but allows for extended views. 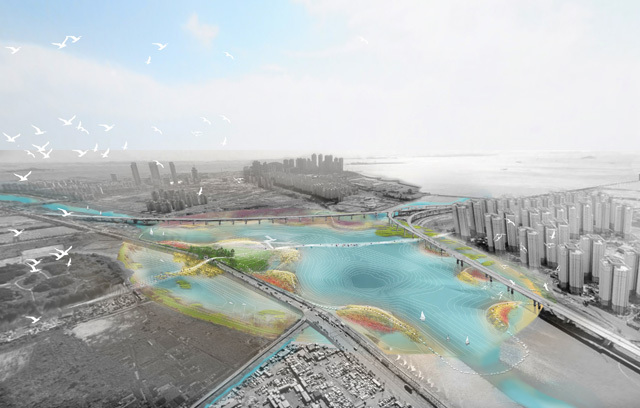 The floating pontoon bridge made of recycled buoys raises and lowers with the tide without touching the ground. Oyster farms that filter the water are suspended from the understructure. 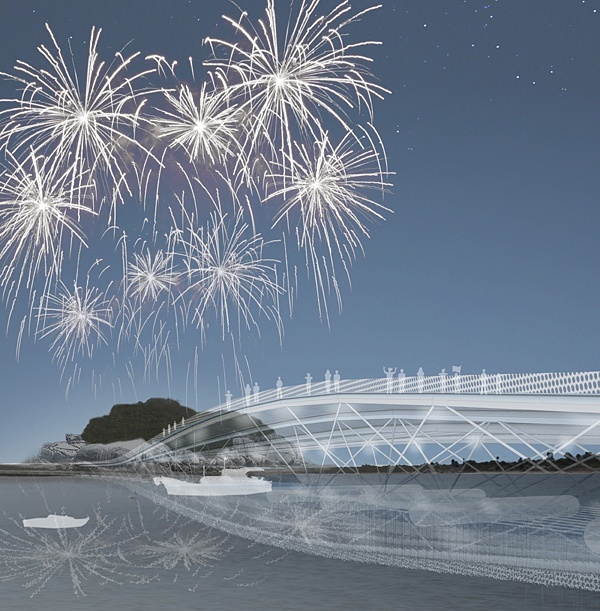 The new pontoon bridge becomes a connective infrastructure between city and waterfront and becomes central viewing area for yearly festivals.